Thanksgiving is a great time for families to get together. I don’t think is anything better than a house filled with friends and family, with the kids running around. It is a great time for the adults to catch up and enjoy time together, while the kids get to see family they haven’t seen in a while and play with the kids. 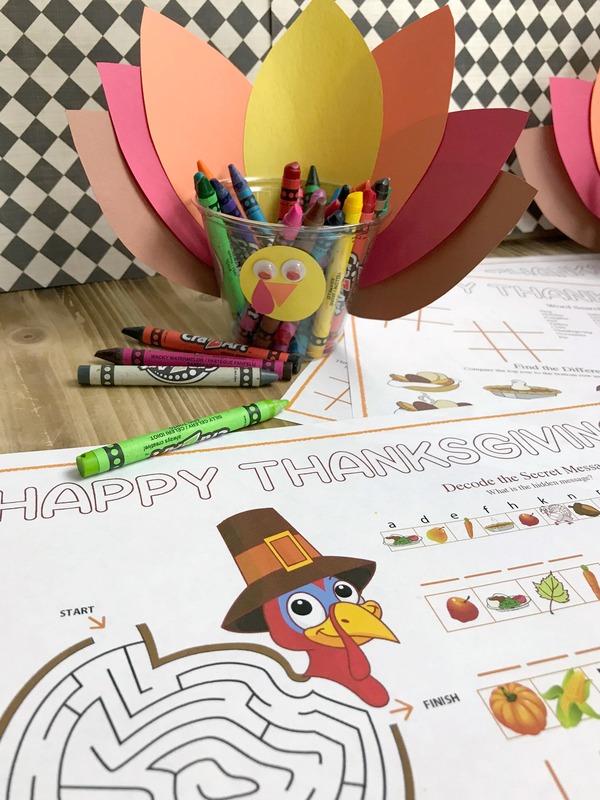 This printable Thanksgiving placemat and a cute turkey craft will help the kids have some extra Thankgiving Day fun. Thanksgiving is a fun holiday. It centers around family, friends and food. I don’t know if there could be anything better. Whenever I host Thanksgiving at my house, I like to have things for the kids to do. Different Thanksgiving activities help keep kids entertained and also lets them enjoy more Thanksgiving fun. 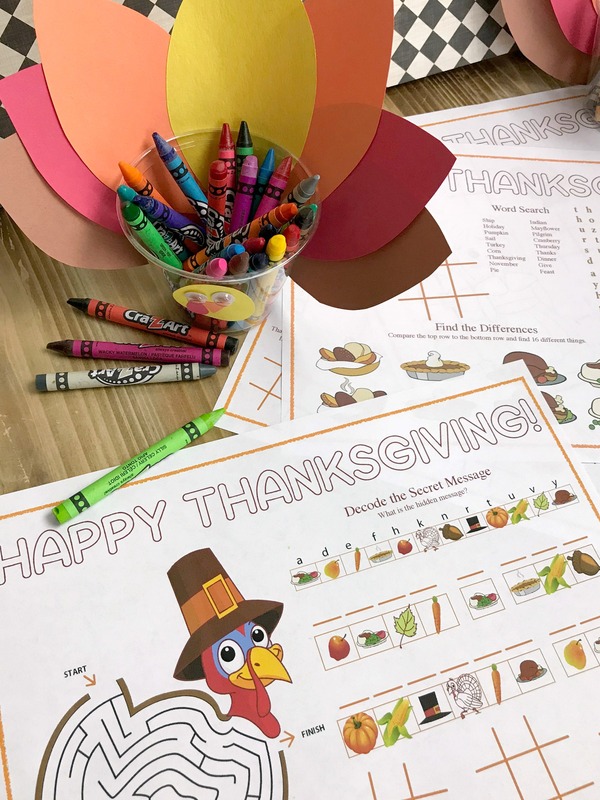 Much like the placemats that are used for kids menus, this free printable Thanksgiving placemat features lots of different activities. 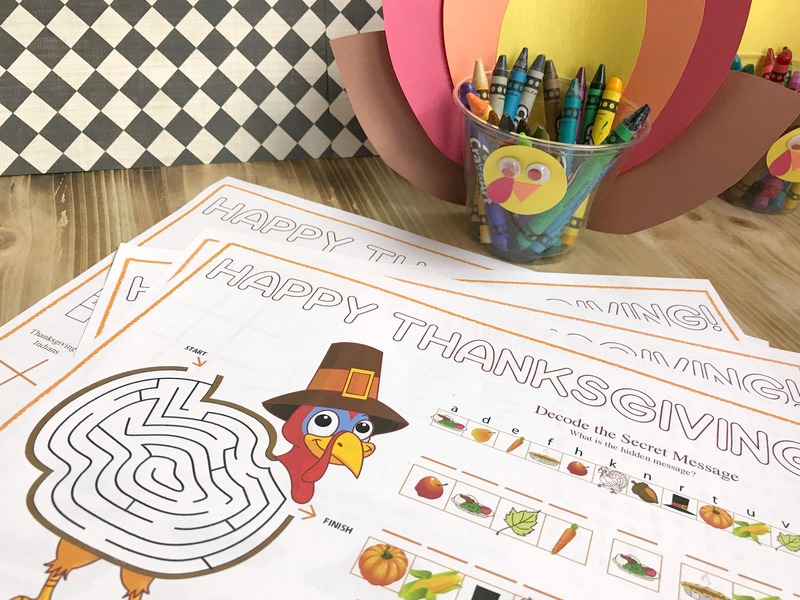 With things to color, a Word search, Decoding a Secret Message, Tic Tac Toe, Find the Difference, a Crossword Puzzle and a Maze, kids will love this placemat. There are 4 different placemats to choose from. Print one or all of them and give the kids a choice. Each one has different style of activities. The kids can also enjoy drawing their own picture of the back of the placemat. 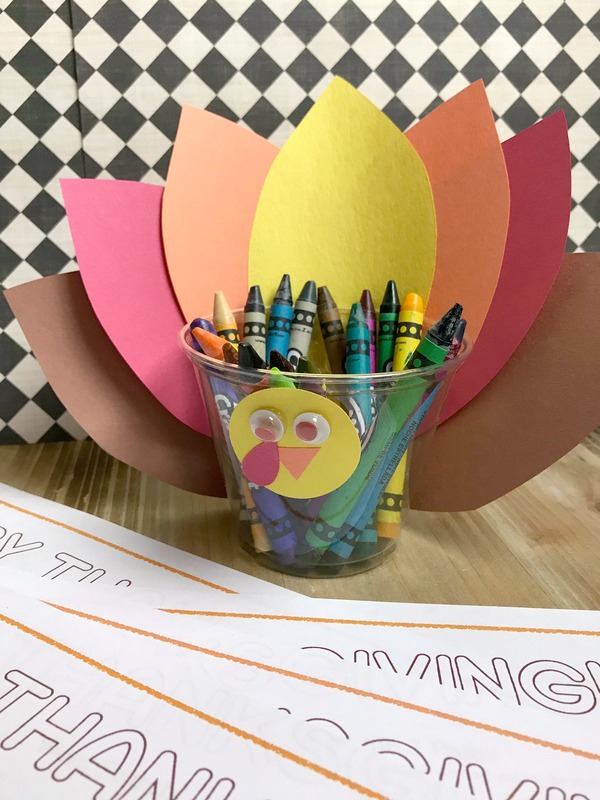 If you are looking for a fun way to decorate the kids table, or just want another Thanksgiving craft for kids, this turkey crayon cup is a great idea. 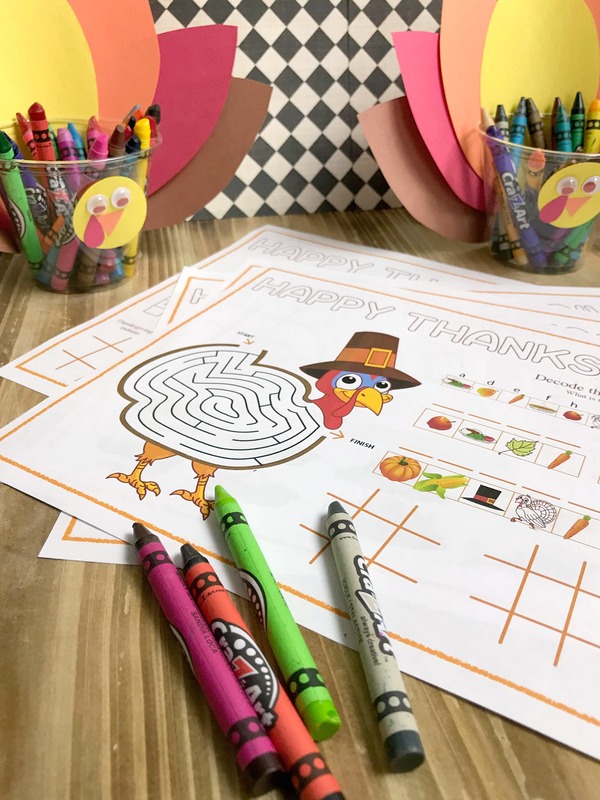 This is a simple Thanksgiving Day craft that the kids can make, mostly by themselves depending on the age, and it will make a great make and take Thanksgiving craft. If you want the kids to take longer on this craft, let them use safety scissors, the hole punch and glue in order to put the craft together. Or have everything cut a head of time and then the kids can just glue the turkey together. 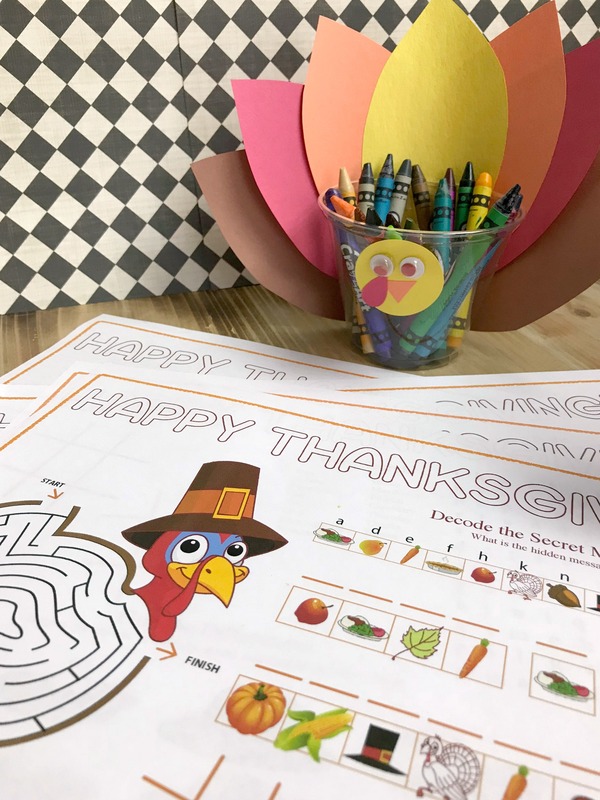 If you want to make this Thanksgiving craft even more about the true meaning on Thanksgiving, have the kids use the crayons to write something they are thankful for on each turkey feather before gluing it in place. 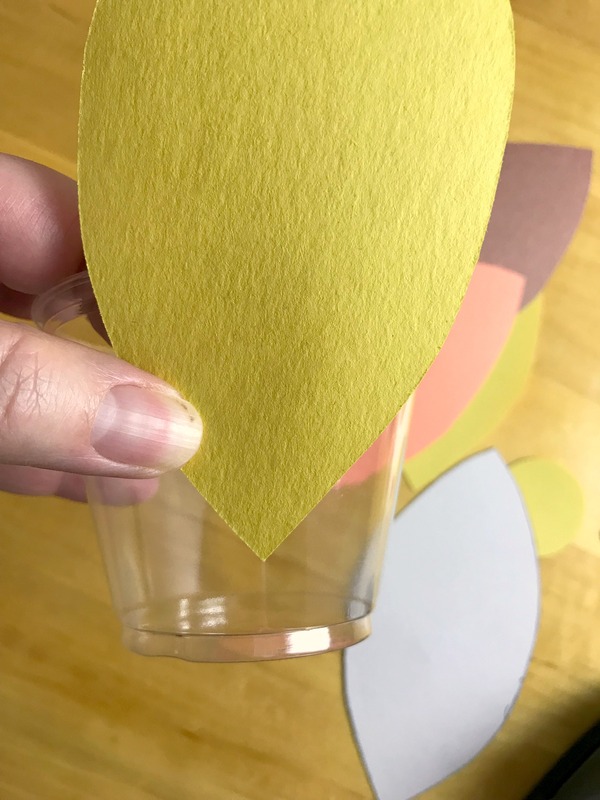 Cut construction paper into leaf shapes (or use real or artificial leaves), with two of each color for each cup except for yellow which only requires one for each cup. Also cut orange construction paper into triangles as beaks and red construction paper as the turkey wattle, one for each cup. 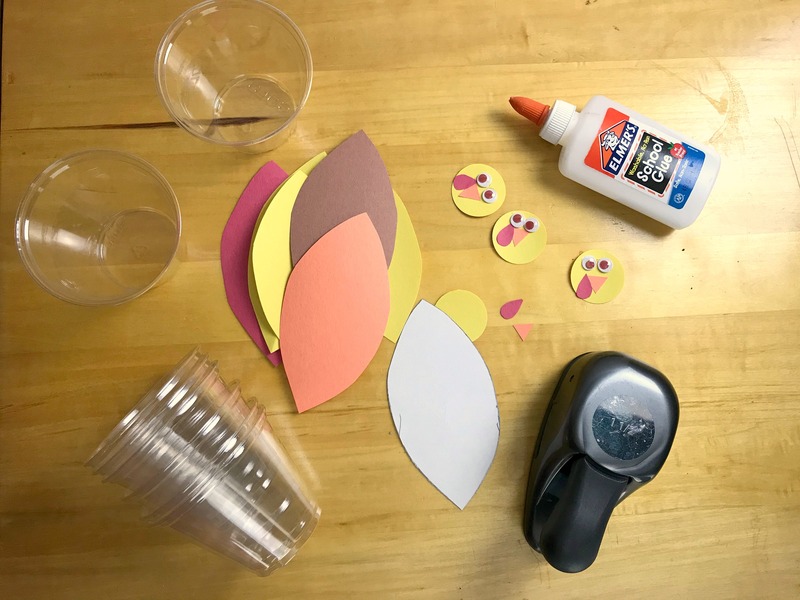 Use the circle punch to cut the turkey head from yellow construction paper, one for each cup. 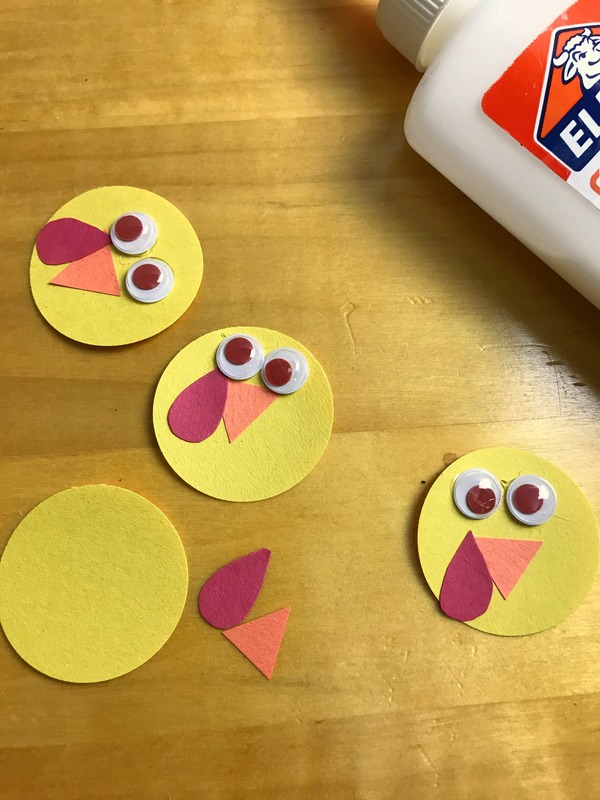 With the hot glue, cut the beaks and wattles as well as the google eyes, create a turkey face on the yellow circles. Glue one completed face to each cup. Turn the cup and use the glue to attach the tail feathers on the back. Once glue has set, add crayons to the cups. 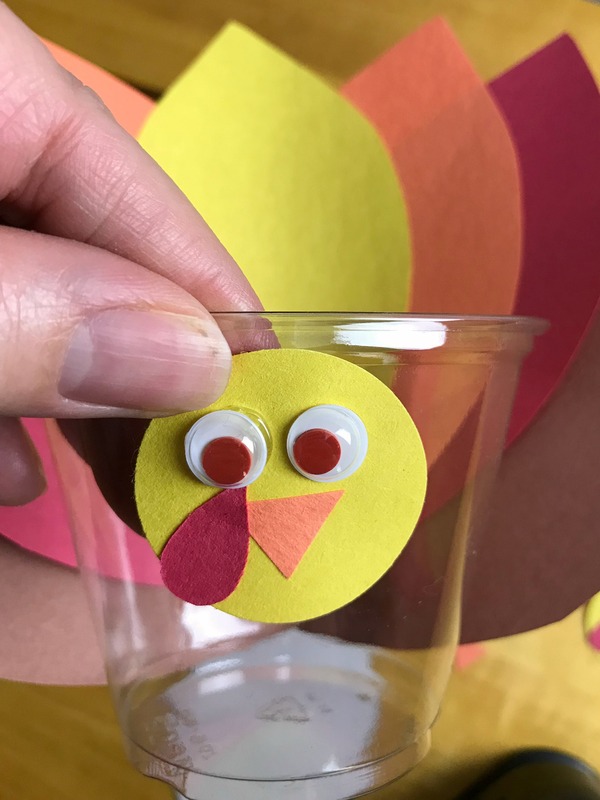 Get the prinable Turkey Placemat pdf file and make this turkey crayon cup for all the kids to enjoy. You might also enjoy making these upcycled bird feeders. That turkey cup is too cute. I never would’ve thought of that!